The bird liver delicacy foie gras was banned from restaurants Wednesday in a measure approved by the Chicago City Council after members decided it was inhumane to force-feed the birds. "Our city is better for taking a stance against the cruelty of foie gras," said Alderman Joe Moore, who sponsored the ordinance. Mayor Richard Daley opposed the measure. "We have children getting killed by gang leaders and dope dealers. We have real issues here in this city," said Daley, the Chicago Sun-Times reported on its Web site. "Let's get some priorities." Rich and buttery, foie gras - French for "fat liver" - is often served sliced and pan-seared, frequently with fruit or atop greens or a cut of steak or veal. To fatten the liver of waterfowl, a tube is often inserted into their throats twice a day and partially cooked corn is pumped down the esophagus. Several Chicago restaurateurs opposed the ban, saying they did not want politicians meddling with a product steeped in tradition. But others had stopped serving it before the ban was approved. California is the only state to ban the force-feeding of birds to produce the gourmet liver product, having passed a measure that would end the practice by 2012. More than a dozen countries, mostly in Europe, have banned production of the delicacy on the grounds of cruelty. 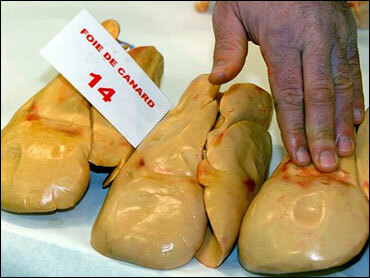 But in France, foie gras has been declared "part of the cultural and gastronomic patrimony, protected in France."